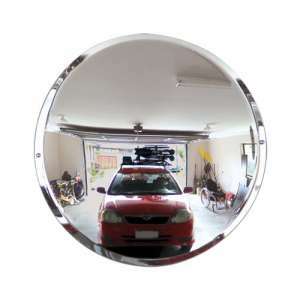 The 24" Garage Parking Mirror will effectively improve visibility and safety for narrow parking spaces in home garages and multi level parking lots. With just a quick glance up at this wall mounted convex mirror, a driver can see their absolute alignment in real time, enabling quick adjustments for side view mirrors and roof clearance, ultimately avoiding damage to vehicles and building structures. This acrylic safety mirror also allows a driver to check for pedestrians including small children when navigating through tight parking spaces. Easy to install, with very little maintenance and no ongoing costs. (For indoor use only). Includes 2 x Dome Capped Screws for Wall Mounting. Mounting Holes 2 x 1/5"
Carton Dimensions 30" x 3" x 30"